We are in the midst or a revolution in information and we have an opportunity. Collectively, we are building the information repository of the future by posting, remixing, liking, and sharing online. Even this post is contributing to that future. This is a chance, if we do it right, to create a place where future generations can find thoughtful, accurate, and positive information. Simultaneously every selfie, snarky tweet, and dub-smash teens and twenty-somethings are posting is also contributing to the online world. While researchers, policy makers, parents, and educators discuss the future of safety and privacy online, these younger contributors should have a seat at the table. Other stakeholders can agree on best practices and even regulations – well maybe they can – but that will do no good if young contributors to the online world have no input and no interest in following them. Safety: Protect users of connected technology from predators and scams. Privacy: Protect information belonging to the users of connected technology so that their lives, finances, and careers will not be disrupted by a breach. Positivity: The world, and the Internet that is part of it, is a big and sometimes cruel place. It doesn't have to be that way. We can make it better. Ok, yes. I know I've simplified these interests. But that doesn't make them less real. There are already examples of students giving the input they should be allowed to give. These are strategies that can be implemented in classrooms and schools around the country. Host a Student Panel - Students who are leaders in their schools and communities can share their perspectives on realistic approaches to combatting negativity online and supporting their peers. Watch the panel from Safer Internet Day in this video and be inspired. Why not ask your own student leaders to be on a panel? Host it in the evening so the adults in your community can attend, ask questions, and come together with your students to make a real difference. Role Reversal Activity - Schools all around the country joined the live audience and asked their students to come up with solutions that experts and policy makers have not solved yet. Why not pose these questions to your students? Ask them to tackle topics like sexting, online empathy, and balancing face time with screen time. The questions and supporting resources – videos and brief articles – are available here. The answers from the students at Safer Internet Day 2016 are here. But many teachers from around the country, from Utah to Florida to Massachusetts, have already taken part in their schools and engaged the students who were right in front of them. You can too. The next Safer Internet Day will happen in February of 2017, but there is no reason any of us have to wait that long to ask our students to join the discussion. Educators know that when students are able choose how they learn they are more invested in their learning. The first step is to personalize learning. Then, students should have an opportunity to share their work far beyond the four walls of their classroom. Personalized learning happens when students have choice around how they want to tackle learning goals and challenges. Often, when students get a chance to choose, they choose to access information, collaborate, and create using technology. There is a lot of research on the benefits and tons of information out there on how to manage this type of learning in your classroom. For more information be sure to check out the Blueprint for Personalized Learning from the Rodel Teacher Council. Publishing their final product can lead to something much more valuable than a grade: recognition. In this article, Should Students Publish Their School Work Online?, two students share their reasons for choosing whether to publish their academic work to the world online. Consider showing this article to your students to open the discussion. When our teens share examples of their best academic work online they are contributing positively to the Internet and building confidence. All over the country, and especially in my home state of Massachusetts, student driven technology integration courses are taking hold. Students are working alongside their teachers to use mobile devices, edtech apps, and lots of other on-hand tech to make learning more collaborative and creative. Reach out to the students at these schools. They are already making a difference there and are happy to provide insight into how building a program in your school will make a difference there too. There are many ways for schools, experts, advocates, and policy makers to engage kids. If they are helping to create our Internet, they need to have a voice in how to shape its future. Which of these options will you apply in your school community? 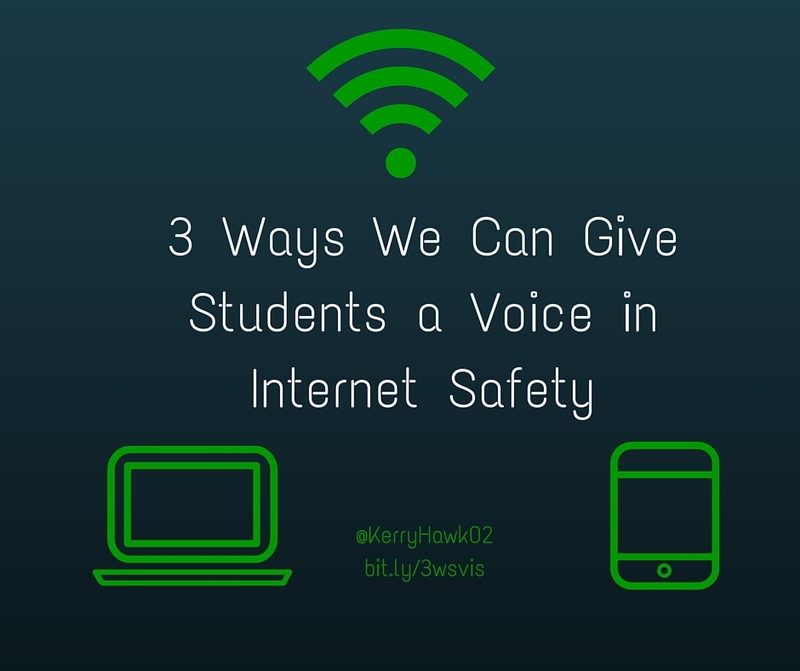 What are some other ways you've invited students to have a seat at the table when talking about safe use of technology? 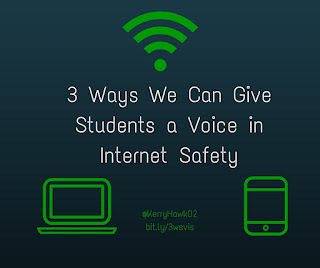 How will you amplify your students' voices once you have engaged them? How will you ensure they have been heard?